This article is about a scenario. For the roguelike computer game, see Linley's Dungeon Crawl. A dungeon crawl is a type of scenario in fantasy role-playing games in which heroes navigate a labyrinthine environment (a "dungeon"), battling various monsters, and looting any treasure they may find. Because of its simplicity, a dungeon crawl can be easier for a gamemaster to run than more complex adventures, and the "hack and slash" style of play is appreciated by players who focus on action and combat. However dungeon crawls often lack meaningful plot or logical consistency. The first computer-based dungeon crawl was pedit5, developed in 1975 by Rusty Rutherford on the PLATO interactive education system based in Urbana, Illinois. Although this game was quickly deleted from the system, several more like it appeared, including dnd and Moria. Some[who?] distinguish "dungeon crawlers" from rogue-likes and RPGs with stories and character-interaction, and consider any game which features ample amounts of dungeon exploration (including Zork, Zelda, and tabletop RPGs) to be dungeon crawls. More recently, 1st person RPGs, particularly ones which are aligned to a grid system and can be mapped on graph paper, have also been considered dungeon crawl games. Dungeon crawls in the role-playing game Dungeons & Dragons were influenced by J. R. R. Tolkien's The Hobbit and The Lord of the Rings, the Lankhmar short stories by Fritz Leiber, and by the "Cugel" stories from the Dying Earth books by Jack Vance. According to Gary Gygax (in an interview with Dungeon #112), the first dungeon crawl was part of a wargame in which the invading force entered the enemy's castle through a former escape tunnel dug from the fortress's dungeon. The group had so much fun with this scenario that it was repeated over and over with increasingly complex dungeons until the wargame aspect of the game was dropped in favor of exploring the dungeon. 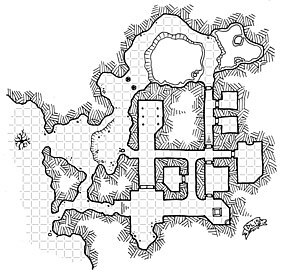 For pen and paper role-playing games, visual aids such as maps, models, or miniature figures are often used to represent the landscape of a dungeon crawl. Due to their potential for simplicity and the limited expectations most players have for plot and logical consistency in dungeon crawls, they are fairly popular in role-playing video games. The roguelike genre is a common and typical example, with endless procedurally generated dungeon terrain and randomly placed monsters and treasures scattered throughout. Computer games and series from the 1980s, such as Wizardry, The Bard's Tale, Cosmic Soldier, Might and Magic, Megami Tensei, Phantasy Star, Dungeon Master, Madō Monogatari and Gauntlet, helped set the genre's standards, while the primitive graphics were actually conducive to this style, due to the need for repetitive tiles or similar-looking graphics to create effective mazes. Some dungeon crawlers from this era also employed action role-playing game combat, such as Dragon Slayer and The Tower of Druaga. Variations on the dungeon crawl trope can be found in other genres. Recent years have seen a modest resurgence in their popularity, particularly in Japan, largely due to the success of the Etrian Odyssey series by Atlus. An in-game screenshot from Legend of Grimrock a first-person tile-based dungeon crawler in the style of Dungeon Master. In the center of the image, the view into the Dungeon. On the right, the open inventory of a party member. This subgenre consists of RPGs where the player leads a party of adventurers in first-person perspective, typically in a grid-based environment. Examples include the aforementioned Wizardry, Might and Magic and Bard's Tale series; as well as the Etrian Odyssey and Elminage series. Games of this type are also known as "blobbers", since the player moves the entire party around the playing field as a single unit, or "blob". Most "blobbers" are turn-based, but some games such as the Dungeon Master, Legend of Grimrock and Eye of the Beholder series are played in real-time. Early games in this genre lack an automap feature, forcing players to draw their own maps in order to keep track of their progress. Spatial puzzles are common, and players may have to, for instance, move a stone in one part of the level in order to open a gate in another part of the level. In massively multiplayer online games, an instance is a special area, typically a dungeon, that generates a new copy of the location for each group, or for certain number of players, that enters the area. Instancing, the general term for the use of this technique, addresses several problems encountered by players in the shared spaces of virtual worlds, but also sacrifices the social element of shared spaces, and the feeling of realistic immersion in that virtual world. They also tend to be a lot smaller and more linear. Munchkin - a parody dungeon crawl game. ^ DeVarque, Aardy. "Literary Sources of D&D". Archived from the original on July 21, 2007. Retrieved 2007-02-23. ^ Parish, Jeremy (2011-09-15). "TGS: Beyond the Labyrinth is Beautiful But Puts the "Crawl" in "Dungeon-Crawler." (Nintendo 3DS) - Konami's new 3DS RPG is probably too specific to Japanese tastes to come to the U.S." 1UP.com. Archived from the original on 28 November 2011. Retrieved 16 September 2011. ^ Edge Staff (2012-04-12). "Legend Of Grimrock review". Edge. Retrieved 2012-05-09. ^ a b Simon Carless (2004). Gaming hacks. O'Reilly Media. p. 112. ISBN 978-0-596-00714-0. A term used to describe a private portion of a gameworld created just for an individual or group of players. This page is based on the Wikipedia article Dungeon crawl; it is used under the Creative Commons Attribution-ShareAlike 3.0 Unported License (CC-BY-SA). You may redistribute it, verbatim or modified, providing that you comply with the terms of the CC-BY-SA.